DP Fox Ventures, based in Grand Rapids, MI, operates an impressive portfolio of companies ranging from auto sales and motorsports to fashion, sports entertainment and luxury resorts. 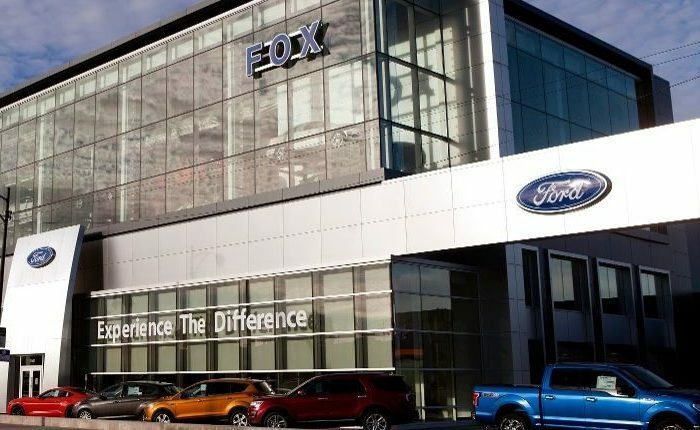 Since their founding in 1993, DP Fox has grown and expanded their presence across the continental U.S.. Fox Motors alone represents 41 automotive brands and is West Michigan’s largest new car dealership network, with nearly 1,000 employees across 25 locations. DP Fox’s VP of IT, Grant Zondervan, explains that their rapid business expansion, especially in the auto dealership chain, created a critical need to move key applications to the Cloud. DP Fox decided to replace their on-prem DMS with a Cloud-based solution called Dealertrack, and to replace their hosted Exchange servers with Microsoft Office 365. This was a huge step forward, as it provided a unified experience and a more scalable infrastructure across all their locations. With the Cloud migration a success, Grant faced a new challenge. Now that these mission-critical applications were delivered “as a service,” an internet outage at any of their locations would take that dealership entirely offline, an expensive scenario that Grant couldn’t allow. With DP Fox’s dealerships relying on Cloud technologies, any lack of Internet connectivity meant that the affected location was out of business. That could mean unhappy customers, frustrated employees and potentially tens of thousands of dollars lost. Internet downtime wasn’t an option. But guaranteeing uptime wasn’t easy. Every location had to deal with different local ISPs, and none of them could ensure uptime by themselves. Their dual-WAN firewalls could provide some failover capability between two ISPs when one went down. But not all applications would stay live during failover, and most of their outages were due to “brown-outs.” That’s when Internet connections were still live, but performance became so bad that applications couldn’t run effectively. Grant explains, “As DP Fox became increasingly reliant on Cloud technologies, Internet uptime had become my most critical metric. We needed a new solution. One that could keep all our locations online and keep our Cloud applications performing as intended. When DP Fox first approached C3 about their SD-WAN needs, they had more questions than requirements. So Ryan wanted to start by introducing a broad range of SD-WAN vendors and using the variety to begin firming up DP Fox’s criteria. Five SD-WAN vendors were chosen to represent the wide array of options. After talking through DP Fox’s business goals and priorities, the list was quickly whittled down to three vendors. First, Grant wanted an SD-WAN that could work with his existing Watchguard firewalls without any modifications to his security policies. As it turned out, most of the SD-WAN vendors required key security functions to be disabled in their Watchguard firewalls and re-configured in the SD-WAN device. This created additional complexity and uncertainty that he couldn’t allow in an area as important as security. Second, he realized that, while some SD-WAN solutions offered a mountain of ‘features,’ many of those features were unnecessary. What’s more, each feature would require manual policies and configurations. That was work he didn’t need his team spending time on. In the end, Bigleaf Networks was the only SD-WAN solution that could provide the uptime, performance and reliability Grant needed without forcing his team to change existing security or spend hours configuring and maintaining manual policies. With so much at stake, Grant wanted to make sure Bigleaf would fit the bill. Deployment started with a 30-day proof of concept at two of DP Fox’s largest dealerships. The Bigleaf routers arrived at the initial sites, and the dealerships were up and running. The entire installation process consisted of plugging the WAN connections into the Bigleaf router, plugging the router into the existing firewall and updating the firewall’s public IP settings to the new IP block provided by Bigleaf. Since Bigleaf looked just like an Internet connection to the firewall, there were no concerns about impacting existing traffic or security. Once connected, Grant was able to see exactly how the Internet circuits at each of the dealerships were performing as well as the impact that Bigleaf had on performance and uptime. This gave Grant the confidence he needed to begin rolling out Bigleaf to all of DP Fox’s remaining dealerships. Today, over 90% of all DP Fox business locations run on Bigleaf’s Cloud-first SD-WAN. Bigleaf optimizes performance for all of the traffic in and out of those sites, including both Cloud application traffic as well as VPN traffic between branch locations and HQ. Bigleaf’s unique Site-to-Cloud Architecture links all of DP Fox’s sites to the backbone of the Internet. So they’re always within a few hops from any Cloud technology that they decide to use. Bigleaf’s intelligent software creates a resilient and high-performance connection utilizing readily available Internet connections anywhere that DP Fox does business. The Dynamic QoS feature automatically detects and prioritizes their most critical Cloud application traffic. The Intelligent Load Balancing feature ensures that those priority applications are routed over the ISP that will provide the best end-user experience. These autonomous decisions are made and implemented 10 times per second, ensuring uninterrupted application performance. And because Bigleaf works autonomously, without the need for manual configurations or policies, Grant and his team can roll out new applications and bring new sites online without worry. Bigleaf sees the change and makes any adjustments needed, no people required. 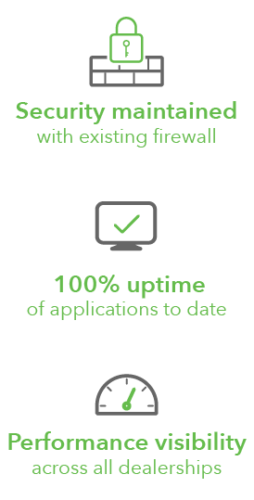 The result to date has been 100% application uptime across all of DP Fox’s locations running on Bigleaf. DP Fox continues to grow, with three new dealerships in the past year, and more coming all the time. For Grant and team, this kind of growth requires the speed and agility of Cloud technologies to keep up.